Potential for severe weather Sunday night and Monday morning as a cold front moves through our area. 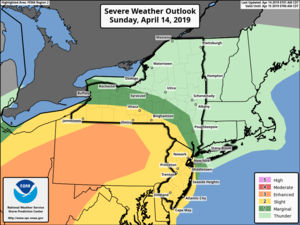 According to the National Weather Service, there is a slight risk for severe thunderstorms in portions of northern New Jersey, the lower Hudson Valley and western Connecticut with the frontal passage late Sunday night into Monday morning. Damaging wind gusts or wind gusts up to 60 mph. This could down a few tree limbs, trees and powerlines. Isolated power outages are possible. Hail up to 1-inch diameter. Flash Flooding: A basin average rainfall of 0.75 to 1.00 inches is expected. Locally heavy rainfall will lead to localized urban and poor drainage flooding. Minor flooding is possible along the lower Connecticut River by the middle of this week. Confidence is increasing that the Monday morning commute may be impacted as a strong cold front moves through the area late Sunday night into Monday morning. The heaviest rainfall is expected to begin around roughly 4 am to 8 am from west to east, with rainfall lasting a few hours at each location.